In case of multiple variable actions, it is not expected that all of them will reach their maximum values simultaneously. For instance, the occurrence of maximum action of large crowds of people and wind, at the same time is very unlikely. This reduced probability is expressed by the reduction factors ψ0, ψ1 and ψ2. In a combination without seismic actions, all variable actions except the first (dominant) action are reduced by y0 or y1, so the total sum of variable actions is γQ·Qk,1+Σ(γQ·ψ 0·Qk,i), i>1[EC0, 4.1.3.]. The reduction factor of variable actions of combination y0 is used for checking U.L.S. When checking reversible serviceability limit states, the factor of variable actions of combination y1 is used which declares the frequent value. The corresponding actions are: γQ·Qk,1+Σ(γ Q·ψ1·Qk,i), i>1. When checking ULS, in a combination including seismic action, all the variable actions of the combination are reduced by the factor y2, so the total sum of the variable actions equals toΣ(ψ2·Qk,i), i>=1 . Since the 'quasi-permanent' actions Σ(y2·Qk,i) are the most probable actual actions to occur at any time, and consequently during earthquakes, they are used in combinations of seismic and accidental actions for the calculation of long-term action effects and for the checking of reversible SLS [EC0, 4.1.3.]. Table 2.2.4: Recommended values of ψ factors for buildings. Self-weight of reinforced concrete buildings is significant both in ultimate and serviceability limit state, thus the wind does not affect them as much as timber and steel structures. Wind forces are strong, but much smaller than dead loads and more than seismic forces (see also the exercise of the chapter). In earthquake resistant buildings, wind and seismic actions should be taken into account independently and not simultaneously. The seismic action, which produces mainly horizontal loading, relative to the wind action, is as a rule greater. Therefore wind influence may not be taken into consideration in the design of earthquake resistant buildings. In Greece, the wind actions are less significant than the seismic actions, even in the lowest seismic zone. Effects of indirect actions should not to be taken into account when checking ultimate limit state of earthquake resistant structures due to sufficient ductility. Exceptions are the heavy fatigue conditions and the stability check when second order effects are considerable. For SLS, thermal effects and shrinkage may be omitted, provided that joints are incorporated per distancedjoint [EC2, 2.3.3(3)]. The recommended value for joints spacing in EC2 is djoint=30 m. When practical reasons require joints provision at greater spacing, the most important effect in serviceability limit state is the formation of cracks at the perimeter of the concrete elements. Cracking could be minimized, firstly through the composition of the concrete mix in combination with scholastic maintenance and, secondly by distributing reinforcement on all the surfaces of the structural elements. [*] NoteControlling cracks with surface reinforcement in the circumferential surface of the structural element, e.g. at the slab roofs, helps in all cases, even when the maximum building’s dimension is less than djoint. In cases of difficult conditions of concreting, e.g. in inclined slabs, surface bonded reinforcement is helpful. The surface reinforcement bears additional micro-cracks formed even during low intensity earthquakes. · In slabs additional light confinement reinforcement is placed along the upper surface, e.g. 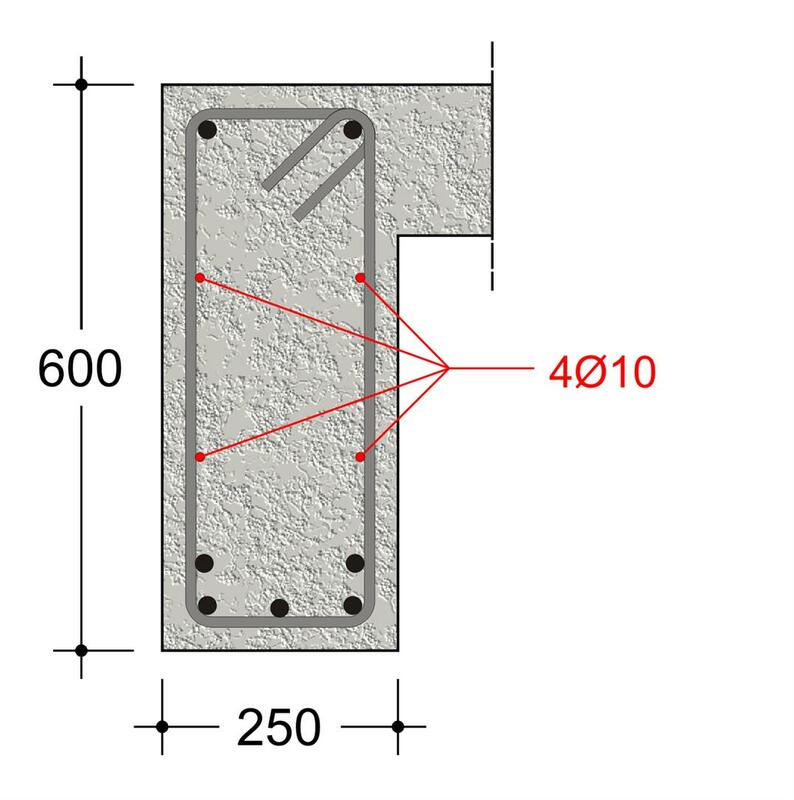 grid Τ196 Ø5/100 mm, provided that there is bending reinforcement along the lower surface. On cantilevers of course, the relevant confinement reinforcement is placed along the lower surface, provided that there is resistance reinforcement along the upper surface (see volume Α', §3.5.3 and for its application §2.6.1). In beams, reinforcement is provided along its upper and lower fibers, therefore lateral longitudinal[*] NoteLateral longitudinal reinforcement, at least of one bar per face, is necessary in any case of beams of depth>50 cm. reinforcement is placed in both vertical faces, e.g. Ø10/250. · In columns and walls reinforcement is placed in all faces, thus there is no need for any additional distribution.